Is anyone else as deeply satisfied as I am, that the venerable Professor’s voice is the voice of the Guide (Mark II) in the new BBC Hitchhikers Guide to the Galaxy radio series? To quote this article and Douglas Adams, he was a ‘hoopy frood who totally knew where his towel was’ - and this has to be the best piece of casting in the history of time, brief or otherwise. I am writing this lying down with a migraine, miked headphones in, computer on the floor next to me - and in a pleasing inversion of the subject of this blog, speaking into a machine that types for me. Without making any outrageous claims about my grasp of the finer points of cosmology, or indeed the seriousness of the present health concerns, somehow the pace and rhythm of speaking seems to mimic the great man’s style, as I slow it down to make sure the program can manage to grab it all. I guess I really wanted to find a way to get the words down, when unable to look at a screen. That got me thinking about Stephen Hawking and his desire to speak. Generally, when we have the desire to speak, that thought/feeling impulse passes in the form of electricity from the brain to the diaphragm, the major breathing muscle, causing it to contract. This fine, parachute-like muscle joined around the base of the ribcage, and descends as it contracts. In doing so it creates a low pressure environment in the chest cavity, and the passive sacks we know as the lungs fill up with air, which flies in to fill up the vacuum. The diaphragm, unless impeded, immediately releases, ascending into the chest cavity and (unless we actively supress it) air flies out through the already-prepared vocal folds in the larynx, creating sound vibrations. All of this happens spontaneously, in a millisecond. So when you don’t have a functioning larynx? What then? In the years leading up to his tracheotomy Stephen Hawking began to struggle increasingly with his efforts to speak. In fact those close to him could understand him, but those unfamiliar with his speech patterns needed a translator. But he persisted. He didn’t go silent, and decide to just type instead for example. He persisted. Why? After his tracheotomy, he began to use his now-famous speech synthesizer. Again – could he have just relied on the written word? Possibly. But he persisted. Perhaps anyone who cared about preserving their mental health would do the same – What would happen to our closest relationships if everything had to be written, and nothing was spontaneous? The reality was that Hawking did have to live with a gap between his impulse to speak and the realization of the communication, whether via voice synthesizer or text. And it’s difficult to imagine that this wasn’t a major grief, of a kind he had no choice but to live with. So he did, from all appearances. And persisted. Because somehow, the process of speaking directly to real people in a room, being present with them, was a critical part of the communication, and was something which the purely written word couldn’t ultimately carry. Watching film of Prof Hawking making the effort to speak pre-tracheotomy when it was so difficult for him is compelling viewing. Even when he typed into his voice synthesizer, it was a great effort, one he had to eventually make with a small muscle in his cheek. Like others with conditions that affect their muscle control – cerebal palsy for example - he had to be crystal clear about what he wanted to say before he made the effort to form the words. This clarity, focus and intention draws us in as an audience. Did we wander off in the long pauses? We did not. We were compelled and present and ready to receive. 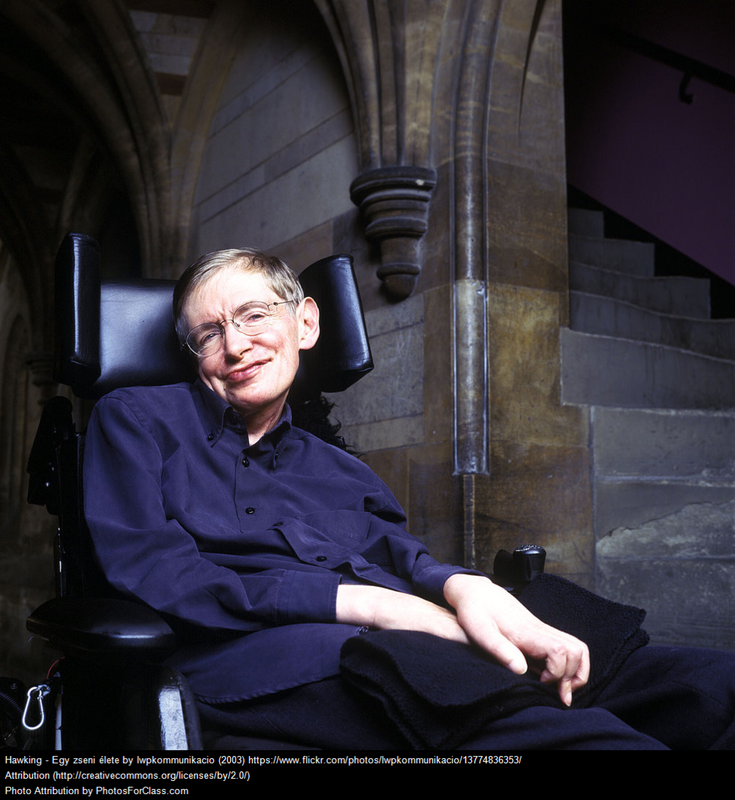 And because he had to choose the most concise and accurate version of his thought, I would speculate that Hawking’s desire to speak gave us the essence of what good science popularization requires. It’s the very essence of ‘clear messaging’. Otherwise known as communication. Otherwise known as caring about the listener. Did they receive your intended message or not? Loud and clear. Safe travels beautiful mind. See a previous appearance by Professor Hawking as Douglas Adam’s super-computer Deep Thought in this BBC documentary.